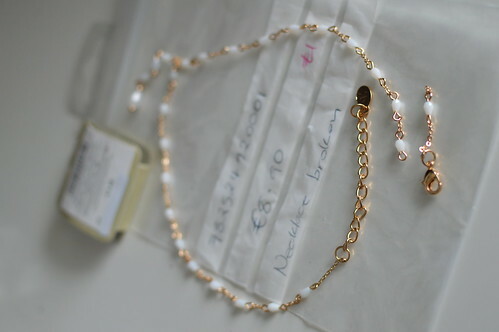 Last month, I scored €296 worth of jewellery for €11 because the pieces were tangled or broken. Now, I’m sharing how I repaired and sometimes reinvented the pieces. I’ve already written about a gold coin necklace with a broken clasp, broken teardrop earrings, and severely tangled brass/glass necklaces. 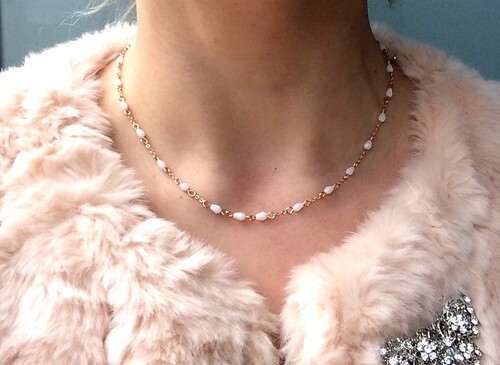 Today’s post is about a necklace that was not only broken, but not my style. See, in the little plastic zippered bags at the shop, I couldn’t tell what the item should look like and for ten cents here or a euro there, I was willing to take a chance, knowing I could use failed repairs for parts, like to make stitch markers. The necklace I’m writing about today had delicate glass beads which I really liked, but I couldn’t tell what the design of the piece was. But for €1, I gave this usually priced €8.90 necklace a chance. First, I spread the pieces out to see what I had to work with. There was a necklace with a kind of Rosary-style droplet in the front and then a length of the necklace with part of the clasp was detached. 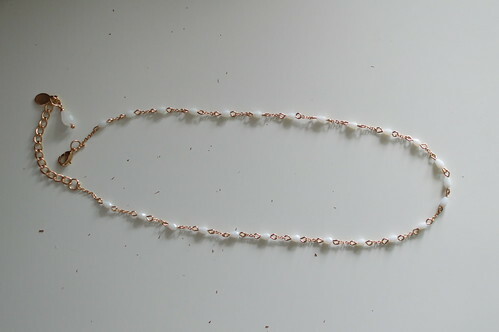 One option was to just reattached the small section and it’s done, but I wasn’t fond of the droplet design so I decided to try reincorporating that length into the overall necklace. 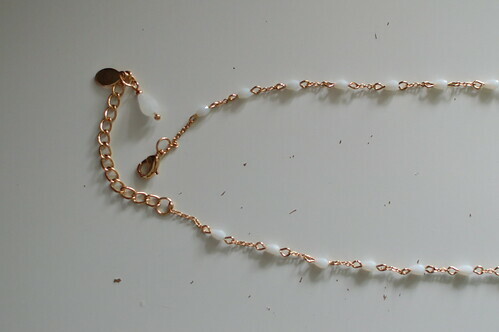 So, what could have been a simple repair became reinventing a rosary style necklace. I detached it from the necklace carefully. Very carefully since these are glass beads. Then I detached the large teardrop from the end of the droplet length and set it aside. 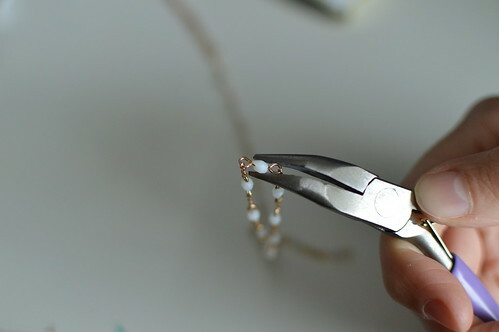 I added the droplet length to the centre from of the necklace. It had a slightly different spacing than the rest of the necklace so placing that length in a special place seemed appropriate to spotlight rather than try to hide its differences. 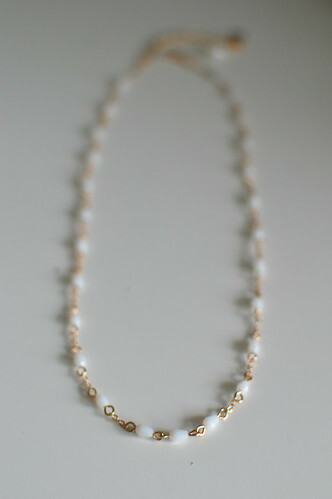 Finally, I added that little clasp length to where it originally was attached to the necklace. The effect feels less religious than the original design, which I prefer. As much as I appreciate and cherish my own Rosaries and prayer, wearing a necklace that looks like but isn’t a Rosary just isn’t for me. It has a gentle Jane Austen feel to it, if you ask me. This entry was posted in Jewellery | Beadwork, Make Do and Mend and tagged 2015 Monsoon Sale, repairing jewelry.